The Controller Area Network (CAN) is a bus structure originally designed for automotive applications, but it has also found its way into other areas. The CAN bus is a balanced (differential) 2-wire interface running over shielded twisted pair (STP), unshielded twisted pair (UTP), or ribbon cable. Several different data rates are defined by the standard, with 1 Mb/s being the fastest for CAN. The more recent variant, CAN FD, has increased transmission speeds to 10 Mb/s, while also increasing the package payloads. To maintain signal quality, the bus requires 120Ω termination resistance at each end of the cable. Since its introduction in the 1980’s CAN has been used to transfer data between powertrain ECUs, and with many manufacturers preferring to stay with the proven technology, CAN and LIN are set to remain in the architecture of the modern car. Greater integration between vehicle subsystems means that, in addition to handling sensor and actuator signals, many ECUs communicate over 2, 3 or more serial buses at a time. For example, it is very common for an ECU to communicate over both CAN (for critical systems) and LIN (for lower-priority controls, such as windows and mirrors). 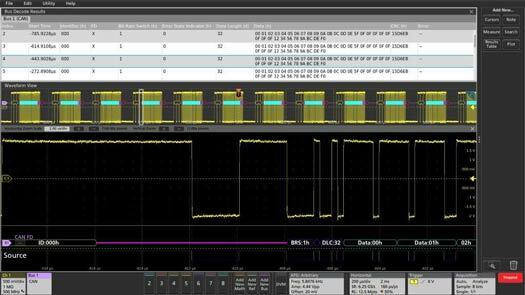 Decoding serial bus protocols manually is time consuming work, and it’s easy to make mistakes. Tektronix’s automotive bus decoding and triggering packages provide straightforward, automated decoding and triggering for popular ECU buses like CAN, CAN FD, LIN and FlexRay. However, protocol decoding is just the beginning. Troubleshooting problems when a bus doesn’t work, or worse yet, works intermittently, goes beyond the bus traffic and into the realm of signal integrity. 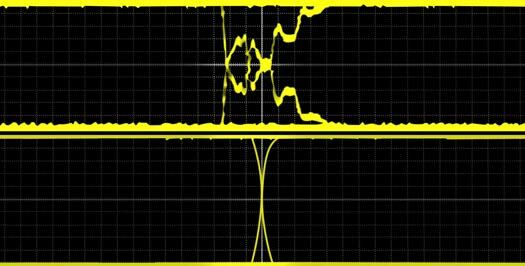 Often these problems, emanating from signal integrity issues in the physical layer - like crosstalk, noise, and improper termination – are most effectively detected through waveform analysis. An oscilloscope allows the engineer to examine the analog bus waveforms to evaluate signal quality and noise, as well as study multiple signals to look for interactions and identify crosstalk. The CAN bus requires 120 Ω termination. An unterminated bus will result in poor signal quality (upper signal). ECUs communicate via CAN, LIN, and other buses, and directly with sensors and actuators. With the complexity of the multi-bus and multi-sensor/actuator systems it’s often difficult to get an overview of the working environment. Most of Tektronix’s scopes allow the user to view multiple buses and control signals simultaneously. Mixed signal oscilloscopes enable the use of digital channels for bus decoding, freeing up analog channels for evaluating signal quality. The 5 Series MSO is especially good at providing visibility into complex ECUs, thanks to its high channel-count, FlexChannel inputs, and large HD display. Learn how to Debug CAN, LIN, and Flexray Automotive Busses with an Osciloscope. This vides shows how to set up automated CAN or CAN FD bus decoding, triggering, and search on the 5 Series MSO mixed signal oscilloscope. Facing challenges in other connected car applications?